Recaptured Images Are a Good Way to Fool Forensic Analysts… but Not those Equipped with Amped Authenticate! 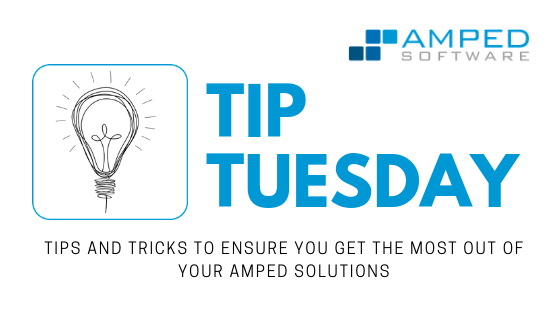 Hello dear Amped Blog readers, welcome to this week’s Tip Tuesday. Today we’ll be dealing with one of the most sneaky kinds of fakes: recaptured images. A recaptured image is a “picture of a picture”: you display your (possibly forged) image on a screen, or you print it on paper, and then you take a picture of it. 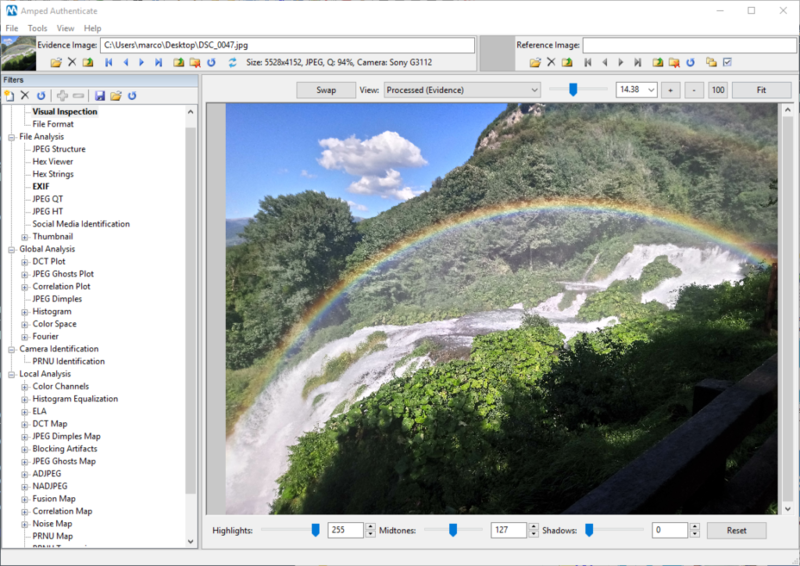 This apparently naive approach is much more clever than it seems: the obtained image will be a “camera original” image to all extents, so it will likely pass every test based on metadata/format analysis. Are we left alone against this subtle threat? Of course not, Amped Authenticate is here to help. Let’s find out how. This entry was posted in Authenticate, Tip Tuesday on April 16, 2019 by Marco Fontani. Welcome to this week’s Tip Tuesday! Today we are showing you an interesting, perhaps a bit hidden, functionality of Amped Authenticate. There is no need to introduce the PDF file format: it is surely the most widespread format for sharing digital documents. 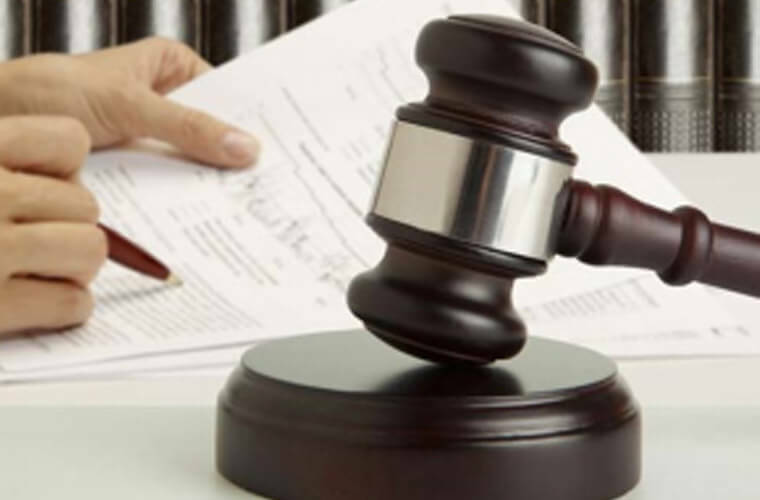 Therefore, it may easily happen that you have to deal with a PDF containing images and that some of them get questioned. What would you do in such a case (after realizing that if you drag-and-drop the PDF into Amped Authenticate, nothing happens, because it’s not an image file)? Would you take a screen capture of the picture and work with that? “Nooo!” – I hope you said! 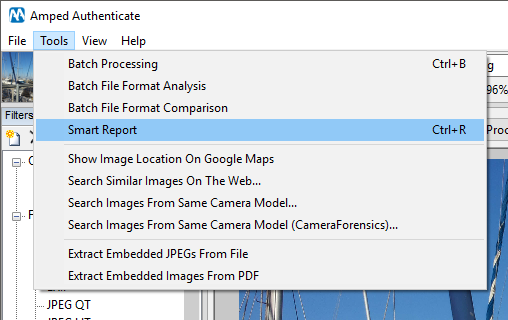 Screenshots are evil for image forensics! Ok, you would get some pixels to work with, but you would lose all metadata, you would lose encoding properties, you could be recompressing data… That means you cannot check image integrity, and finding manipulations becomes much harder. No, there’s a better way of dealing with images embedded in PDFs, and we’ll show you how! This entry was posted in Authenticate, Tip Tuesday on March 19, 2019 by Marco Fontani. Clones Blocks and Clones Keypoints: which one is better? removing an object from the scene by covering it with a cloned portion of the background. This is explained with a very simple example in the image below. Two possible ways of using copy-move to create a fake image. 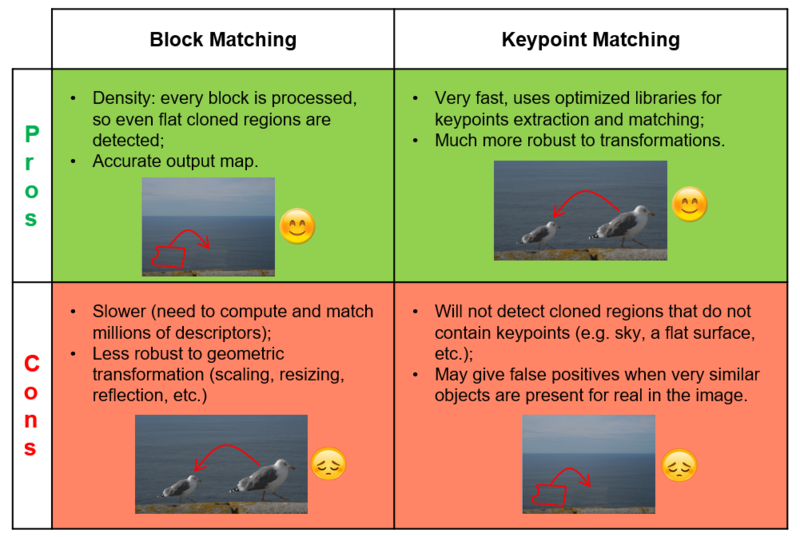 The image forensics research community worked hard to develop techniques for clone detection, and two main approaches have been invented: block-matching and keypoint-matching. As suggested by their names, they are based on two different strategies, briefly explained below. 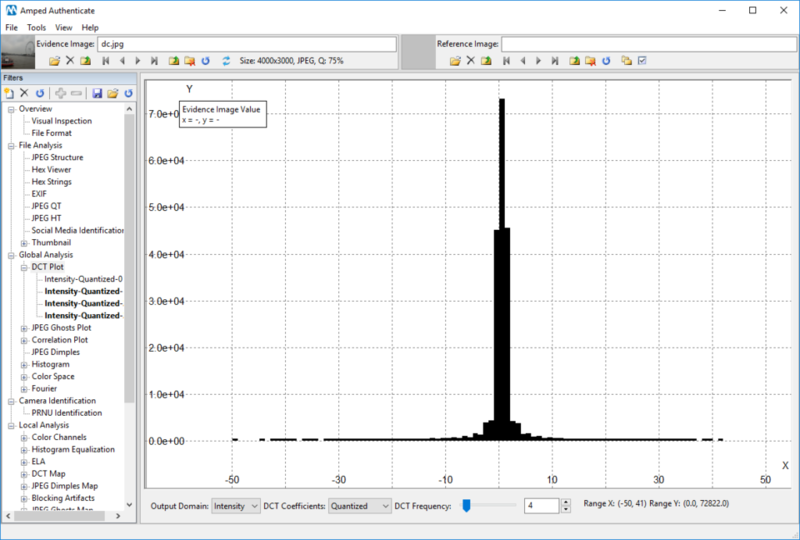 Search for clusters of matching descriptors. Search for (clusters of) matching keypoints. So, if your question was: “Do I need a block- or a keypoint– based algorithm for my analysis?”, the answer is: you need both! 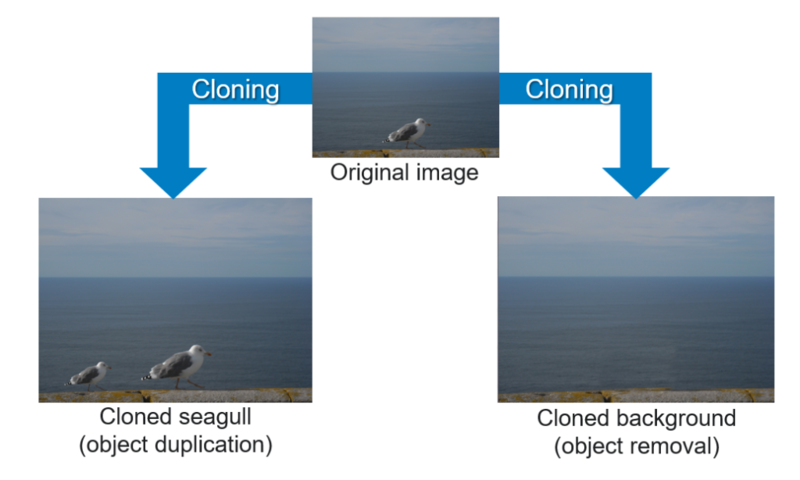 We see that the cloned seagull (top row) is detected by the Clones Keypoints despite the strong down-scaling applied to the cloned object; such a geometrical transformation is too strong to be detected by Clones Blocks. On the other hand, Clones Blocks successfully detects the cloned background (bottom row), that is not detected by Clones Keypoints because the cloned area is just too flat and it does not contain enough keypoints. We hope you enjoyed this quick tip! Stay tuned and don’t miss our next #ampedtiptuesday post! This entry was posted in Authenticate, Tip Tuesday on January 15, 2019 by Marco Fontani. 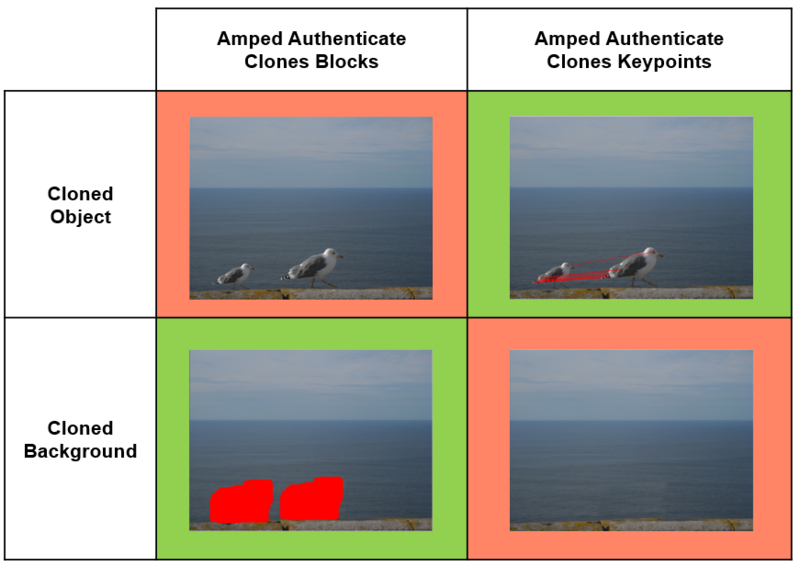 Amped Authenticate Update 11362: JPEG Dimples, Improved JPEG HT, Social Media Identification, and much more! Not long has passed since the release of Amped Authenticate 10641 but… yes, the next one is already out! Amped Authenticate 11362 is now released with a lot of improvements, including two new filters based on JPEG Dimples, one of the last discoveries of the image forensics scientific community! Despite many attempts to send JPEG into retirement, today the vast majority of digital images still use it. Amped Authenticate users know that traces left by JPEG compression are a superb asset when it comes to investigating the digital history of an image, as witnessed by the vast JPEG-based toolkit that Authenticate provides: quantization table analysis, JPEG ghosts, inconsistencies in blocking artifacts, double quantization traces in the DCT coefficients, and more. But JPEG is still full of new surprises nowadays! A few months ago, while Amped was attending (and sponsoring!) the IEEE 2017 International Workshop on Information Forensics and Security (WIFS 2017), a new footprint was presented to the scientific community: JPEG Dimples (click here to see the original work Photo forensics from JPEG dimples by Shruti Agarwal and Prof. Hany Farid). 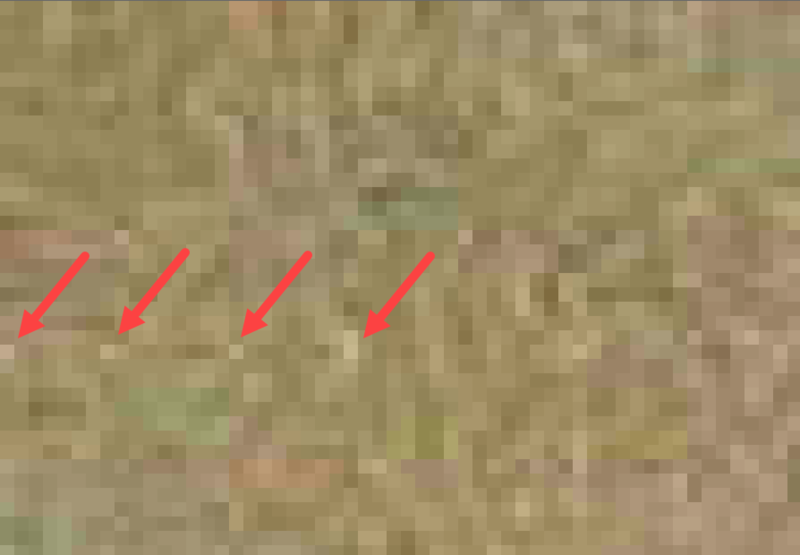 JPEG Dimples manifest themselves as a grid of slightly brighter/darker pixels, spaced by 8 pixels in each dimension. Like most image forensic fingerprints, even JPEG Dimples are hardly visible by the human eye, but they can be easily detected with a proper algorithm. But why does this grid appear? And why is it important for our analysis? We’ll answer these questions in detail in a future blog post, however the reason behind JPEG Dimples is rather simple: during the DCT coefficients quantization phase, different operators exist to approximate decimal values to integer values: the round operator (which approximates the decimal number to the nearest integer) the floor operator (approximation to the nearest smaller integer) or the ceil operator (approximation to the nearest bigger integer). The table below shows the difference in approximating a Value (first column) to an integer using round, floor and ceil. Obviously, using floor tends to produce smaller values in the 8-by-8 DCT block than using round, and the opposite with ceil. And when we go back to the pixel domain, this leads to a slightly darker or brighter pixel on the top-left corner of the pixel block (see example below)! Measuring the presence of this grid will tell us to which degree an image contains the JPEG Dimples footprint. This entry was posted in Announcements, Authenticate, How to, New features on July 5, 2018 by Marco Fontani.